For a long time hotels did not just underutilize data, but were intimidated by it – the amount of it, and where and how to even begin analyzing and using it. When used effectively, data can provide hoteliers with the opportunity to improve customer interactions, their revenue and the way they run their business. Presently, applying hotel data faces the same challenge many other industries face: proper data management. With a cloud-based property management system, collecting data, understanding and use it effectively has become easier. With a proper system in place and good data hygiene (i.e. clean, organized, and error-free), the possibilities are endless. Here are just 3 ways hotels can use data to increase revenue. Hotels that accurately predict demand for rooms can price accordingly and turn a nice profit. A lot of hotels still try to do this process manually – which is painstaking, more often than not reactionary and leads to missed opportunities. Advances in real-time analysis means that hotels can use their data more accurately and effectively. With data, hotels can forecast seasonal events that affect occupancy, understand when to lower rates just enough so that they fill their rooms at the highest possible price, even understand booking behaviors to predict cancellation rates. Ultimately data can deliver precision to pricing, allowing hotels widen their margins. Guests leave a trail of breadcrumbs at every stage of the research and booking process. Hotels that make the most out of this guest data can create effective marketing campaigns that drive direct bookings and incremental revenues to their properties. Smart data can help hotels identify relevant audiences and potential guests, identify active shoppers by demographic and source market geography. It can help identify windows of opportunity in each season when you can get the highest exposure for the highest potential return. It can help you identify customers with a higher overall lifetime value allowing you to focus more time and resources where they’ll have the most impact – and bigger financial reward. In summary, data can help hoteliers forecast profitable customers and target them, in real time with relevant offers, giving them the opportunity to convert them from lookers to bookers. 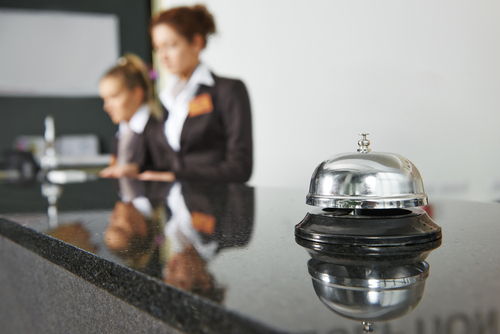 Data gives hoteliers the ability to anticipate guests’ needs. By processing individual customer information through the lens of data analytics, it provides staff with a holistic view of the guest allowing them to personalize offers and influence purchase decisions. Hotels can make a positive impact on the guest experience even before check-in. Analysing and using data effectively, a hotel would already know what its guests like, prompting a customized pre-arrival upsell email with relevant amenity offers and room upgrades. These offers can also extend into the on-property experience, triggering timely, innovative and relevant offers, rewards or discounted services during their stay. Ultimately, data helps hoteliers identify patterns in guest activity, gain a deeper understanding of customer needs allowing them to better target offers, upsell more effectively, create a better, more personalized customer experience, and a more profitable business. The above are only a few of many ways in which hotels can use data to generate and increase incremental revenue. Data isn’t something that can instantly produce results, but when properly managed, analyzed and applied, the results can be magical. Adoption of SaaS is growing exponentially in almost every industry, with SaaS cloud hardware and infrastructure software spending projected to reach $55B in 2026. The hotel industry may be one of the last to join the cloud computing party but more recently hoteliers are now upgrading to next-generation cloud solutions in record numbers and hoteliers who haven’t already upgraded to a cloud platform plan to do so shortly if only to keep pace with others in the same competitive set. 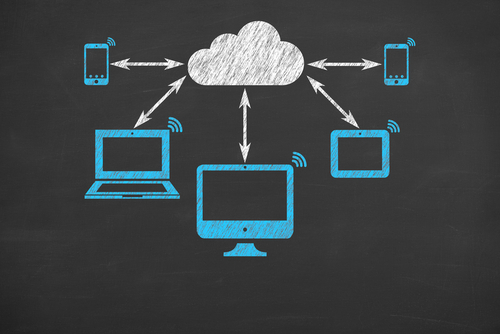 So why are more and more hoteliers now moving to the cloud? Well, the benefits are substantial, from cost savings, flexibility, scalability, employee productivity, and guest service. Today nobody questions the cost savings that come from streamlining operations across all hotel functions and all parts of the property (or properties). A Frost & Sullivan study showed that business can save 50% with cloud computing solutions. It is way more effective to support and update a cloud-based PMS rather than an on-premises system, not to mention the costs associated with running your own servers in the hotel. Cloud offers hoteliers limitless scalability, facilitating, rather than restricting business. Unlike their on-site predecessors, cloud-based property management systems (PMS) are entirely scalable – they have an unlimited capacity to expand. With the cloud, hoteliers now have the agility and freedom to add or remove resources in line with their growth and scale their hotel management systems to the services they offer. PMS systems are required to manage a multitude of tasks, and they have to flawlessly integrate with a multitude of third-party apps and software. The cloud makes it easy to connect all hotel functions and operations. By using clean, Open APIs, hotels can easily integrate other systems without limitations and the fear of yet another cost. For hoteliers, this capacity and the possibilities that it brings are revolutionary; it offers them limitless flexibility to work with the vendors of their choice meaning they can bundle applications together to create a customized management suite that’s right for their business. When you work in a hotel, achieving high guest satisfaction is key and as the ordinary increasingly becomes unacceptable, consumers expect every hotel experience to become seamless and singular. With a cloud-based system, hoteliers know they can meet these evolving demands improving the quality of the guest experience, and guest services, everything from check-in to housekeeping, concierge services and maintenance response times. The cloud enables guest-facing interfaces, including self-service options and allows hoteliers to harness the power of data and analytics to provide a personalized experience. Cloud PMS solutions are geared toward streamlined operations and complete guest management which help further engendering satisfaction and loyalty. The technological beating heart of any hotel is a property management system (PMS). In the past, a hotel’s technology infrastructure was unable to scale in concert with new platforms, it was complex, cumbersome limiting and failed to streamline or enhance day to day duties or guest services. Many hoteliers know that embracing the cloud is a viable future technology investment; not only are they cost savings to benefit from but it allows them to streamline their operations and provide their staff with the flexibility and mobility needed to better serve their guests. Looking to purchase or replace an existing hotel property management system can be a daunting and overwhelming task. The PMS has come a long way since its inception and has evolved to handle so much more than traditional hotel processes such as check-in and check-out. It has transformed into dynamic platform central for hotel operations and is increasingly expected to do more and more on both enterprise and customer-facing levels. Selecting the right system has never been more important. Having the right property management in place can mean more streamlined hotel operations and reduced costs, improved performance reporting and business intelligence, increased hotel occupancy, improved guest experience, and guest satisfaction all resulting in increased revenue and profitability. Cloud-based solutions provide significant benefits to hotels. Long gone are the days where we required a massive cold room on-property to house the primary software and hardware systems of a hotel. Cloud eliminates the need for on-site server hardware and associated expenses, hotels are less dependent on internal IT specialists and everything is done automatically in the cloud by the PMS provider. In addition, security liability is transferred to the supplier, allowing the hotel to shift costs from capital expenditures to operating expenses. Cloud solutions provide far more powerful software that is more flexible, adaptable, more reliable, more affordable and has the capability to scale. The advent of cloud computing has freed hoteliers to implement solutions that are to some extent future-proofed. 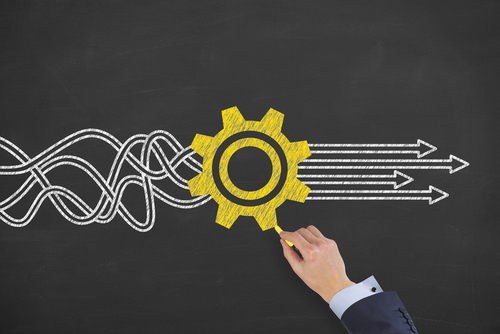 It’s well known that legacy systems do not communicate well with one another and one of the largest challenges hoteliers have faced when it comes to their PMS is a lack of technology integration and/or the complexity of integration with other systems. But as new products are developed, and guests demand more technological flexibility, a hotels PMS should be able to not only connect to their current systems but connect to fresh and innovative platforms easily and with a minimal amount of friction. When looking to purchase a new PMS, the key is to look for a solution that can integrate easily and work with a wide range of providers and emerging solutions. With the introduction of cloud seamless integration and communication between multiple sources is a reality. It is transforming how hotels run providing ease of operations at every level and helping management focus on what’s important: servicing the customer. The goal of any PMS technology should be to provide the executive management team and front-line employees with tools to run the hotel profitably, not to spend their time learning and managing the technology. When considering a new PMS, you should look for a solution that has a high touch/graphic user experience, functional for novices and expert users and requiring minimal training. An intuitive and easy-to-use system that does not require excessive training and is void of the frustrations, errors, and costs associated with more cumbersome solutions, allow employees to get on with, and focus on what matters most i.e. the guest. Managing a hotel is more hands-on than ever and having the ability to manage your property on the go is no longer a want, but a need. “Hotel staff and executive teams cannot be limited to receiving information only when they are their desks”, Jos Schaap, CEO and founder of StayNTouch. The capabilities of modern technologies and delivery methods now ensure that all the information hoteliers need to run the hotel at its optimal effectiveness. So, when seeking out a new PMS you should look for features that prioritize communication and mobility. There are not only operational efficiencies to be gained by being able to access the hotel PMS remotely and on the go but hoteliers also have the ability to now deliver amazing guest service using mobile and tablet devices. It is imperative that any new system you are considering be bundled with 24/7/365 support along with reputable customer service. Similarly, it’s equally important that you do reference checks on the actual service element of the software provider you are contemplating on purchasing. This will substantially reduce any future (costly) headaches. Many elements play a role in the decision to commit to a new property management system and the points listed should be included and considered before purchasing a new solution. There is no doubt that investing in a new PMS is a time-consuming exercise but implementing the right system for your hotel will take your operations, revenue, and service to the next level. More and more hotels are making the switch from traditional or legacy systems to a cloud-based hotel PMS. In the past, traditional hotel PMS systems met the needs of hoteliers being the go-to choice for the majority of properties, whether they were an independent or a multi-property. However, times have (rapidly) moved on, hoteliers have new goals to achieve today and the solutions no longer live in a server room. If you are still on the fence about making the switch, perhaps we might persuade you with a few ways a new cloud-based mobile PMS will help you generate more revenue for your hotel! Upselling, cross-selling, any type of additional selling at a hotel other than rooms has always been difficult and all too often hotel frontline staff miss out on the opportunities that would lead to more sales. However, with a mobile PMS comes automation and an easy way to increase revenue for your property. With access to rich guest data and the ability to automate selling processes, a mobile PMS can make effective upselling easy. At the time of check-in, staff armed with a mobile device or tablet can promote automated upsell options such as upgrades, early or late check-in/check-out and add-ons. Not only are you make your guests aware of the options available but at the same time you are increasing the level of personalization your hotel extends to guests. For hotels with an average of 150 rooms, 60% occupancy, upsell revenue can easily boost sales by $50,000 to 65,000 annually, which represents a small percentage of 3 to 5 upsells per day! Similarly the possibilities of promoting and selling ancillary products and services have also been exponentially enhanced by mobile. A mobile PMS enables hoteliers to interact and connect with their guests at the right moment and enhance their experience. The functionality that a mobile PMS offers means hoteliers can promote real-time offers and sell customized, personalized, relevant ancillary products and services. It is said that more than 60% of consumers would be open to spending more if an additional service complements or enhances their main purchase. Upselling and cross-selling alone will not make a hotel successful – the ability to generate incremental revenue and boost guest satisfaction lies in the delivery of personalized guest interaction. With a mobile PMS hoteliers not only have the ability to enhance the guest experience and their satisfaction but they can monetize on guest requests and preferences yielding better results. A cloud-based mobile PMS solution enables your team to capture, update, store, access and review critical guest information at every touch point. With the ability to gather and access information about guests on the go, hoteliers can identify individual customer needs and recognize what they want. This facilitates better guest engagement and allows you to respond more quickly and efficiently to serve their guests. A mobile-based PMS can drive incremental improvements behind the scenes that save valuable time and resources, enabling staff to deliver those memorable guest experiences. Armed with a mobile device, employees are no longer tied to their workplace and have the ability to manage as easily from a distance as they do “up close and personal”; they have the flexibility to be in multiple places at the same time and efficiently run guest services and operations of their hotel remotely, from the basement to the penthouse, everywhere in-between, and even off-site. The less time that staff spends behind closed doors doing administrative work, the more time staff can spend with every guest, improving the guest experience. Happier, more satisfied guests lead to better reviews, loyal customers, repeat stays and of course increased customer spending! On many levels, mobile is now essential to the continued success of any hotel. It not only potential to increase the productivity of your team, allow hoteliers to run a highly efficient back-end operation but they also empower employees to go above and beyond when providing a personalized guest service helping to increase your guest spend and impact your bottom line in many ways. Mobile has changed the way both consumers and brands think about travel and how they interact with one another. While mobile is impacting many facets of the hotel business, one area where mobile technology is changing the look and function of the hotel is just as you step in the door, right at the front desk. Hotel guests have no love for the front desk, and it generally proves to be an annoyance more than anything else. Creating a barrier between hotel ambassadors and the guest, the traditional model is seen as impersonal and often time-consuming. With mobile usage becoming ubiquitous in our everyday life, the guest has evolved and has become more educated, on-demand and needs instant gratification. Such technological changes are pushing the front desk into a new era, if not into extinction. With a mobile PMS lobbies can become a more flexible space. 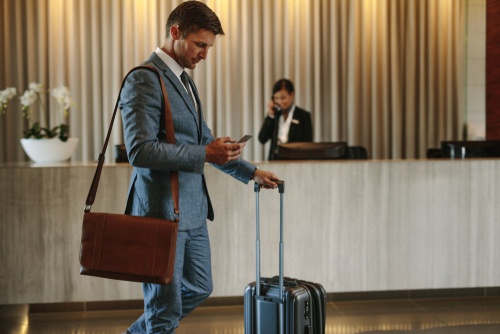 For guests who would prefer a more personal check-in or for particularly busy check-in times, front desk staffed armed with a mobile device can meet customers in the lobby, curbside, or wherever they may be on property, and check them in. Using the tablet, staff can bring up the guest reservation and complete the check-in process, even offering an upgrade or an upsell if appropriate. Room keys can also be provided and the guest is quickly on their way to enjoy their stay. The use of mobile in this way instantly connects customers with employees while transforming the look and feel of many hotel lobbies. It allows hoteliers to provide a highly personalized service, engage with the guest, build relationships, direct the guest and perform the transactions the guest wants all at the same time. 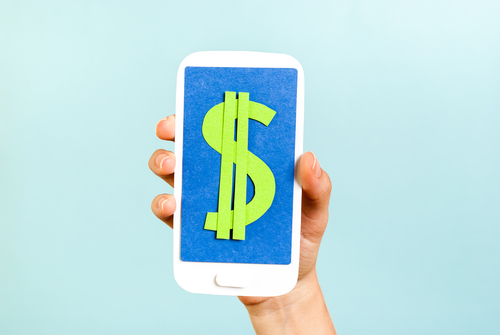 While it has not always been easy to make ancillary sales, the use of mobile provides greater opportunities to upsell and increase ancillary revenues. Checking-in via a self-service station or via mobile can result in additional guest spending; since consumers do not feel rushed when checking in, they can scroll through room upgrade options, spa packages, and dining reservations. Similarly, if a guest is greeted by mobile front desk staff, their check-in interaction feels more personal and the guest is more likely to share information. The hotel then has the opportunity to recommend additional services. Since the guest no longer feels the pressure of having a long line of people waiting behind them, they’re more likely to make dining reservations, purchase a spa package or ask about golf tee times. With a mobile PMS, front desk managers can create new bookings and do much faster check-ins and check-outs; they can keep track of special requests of guests and also respond to issues and requests in a timelier manner. Rather than route guests to the front desk all the time, mobile enables staff to service guests and record and resolve any questions and/or requests on the spot elsewhere on the property promptly. Captured tasks can be directed and delegated to the appropriate department or team. With a mobile PMS solution, staff can go to where they are most needed and remove a lot of inefficiencies in accessing their work while also walking to the area in which it is needed. There is no doubt that mobile is transforming the hotel lobby. Guests want to interact with hotels flexibly and a mobile PMS solution provides hoteliers with the opportunity to move employees from behind the front desk and directly in front of guests. Mobility enables staff to help guests upon arrival and during their stay. Not only will hotels see the benefits of the personal connections formed by being side by side but also improved operational efficiency and increase revenues. Mobile hospitality is the future of our industry, and it should be at the top of your list. The hotel industry is considered one of the most vulnerable to data threats, because hotels process, and in many cases store long term, a very high volume of guests’ personal information and payment card transactions daily. And there is truth to this statement! More than a dozen data breaches and data security attacks have been reported by hotels since 2010, affecting everything from major multinational corporations including Hyatt, Hilton, Kimpton, Omni etc. to single properties. The hospitality industry seems to be a favorite for hackers; in 2016 Trustwave Global Security Report revealed the global hospitality industry has the second largest share of breach incidents! Knowing all that you would think that hoteliers would be cognizant of the issue and proactively ensure their data was secure! However, according to Hospitality Technology’s 2017 Lodging Technology Study, 74% of hotels do not have breach protection and less than half use end-to-end encryption for cardholder data (49%) or use tokenization at the card swipe (46%). Hoteliers need to have their security in order. Why? GDPR. GDPR is an acronym for General Data Protection Regulation. It is an EU regulation that will come into effect on May 25, 2018, and generate the biggest changes in data protection in the EU since 1995. The GDPR was created to bring as much uniformity into data protection as possible, aiming to give control back to citizens and residents over their personal data and to simplify the regulatory environment for international business with a regulation that is far better suited to the challenges today’s digital world poses. And before you say “EU?”, GDPR will also apply to non-EU countries. Despite the fact that this is an EU regulation, GDPR will apply to any organization that is processing or holding EU personal data, regardless of the location in which they are situated. So with the imminent introduction of GDPR, are you aware how the laws will impact the way in which your hotel operates? And what should you do, or really what should you currently be doing to prepare? How will hotels be impacted? A hotel must provide very detailed information on why it needs to process personal data, and how long it plans to keep it. This procedure involves organized retention policies so that a hotel always knows the status of such information. A hotel must keep technical and organizational records to prove it is protecting data. A hotel must outline its guidelines for collecting and managing PII. When it comes to digital marketing and collating of personal information, Hotels need a section on their website that permits “opting in,” thus allowing hotels to store PII data. Hotels also must be able to prove that their audience has given consent for their data to be used for marketing purposes, must also specify which data they wish to be used, and explain the process, enabling guests to access, modify and delete information. If a list of potential customers has been purchased, the hotelier must also receive documentation that proves that consent has been given for the data to be used. 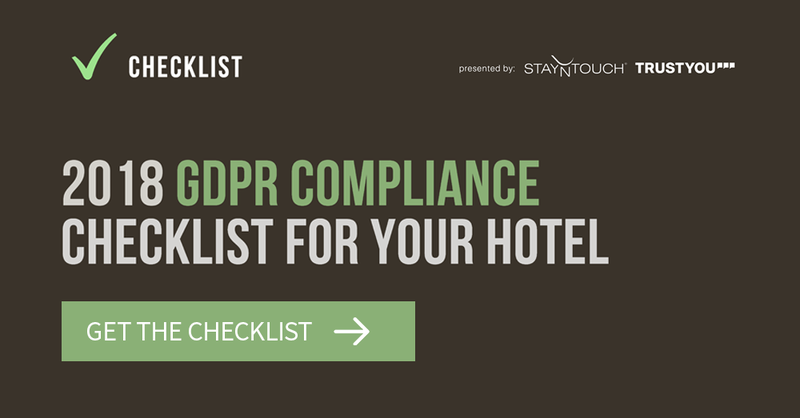 How can hotels prepare and make data compliant with GDPR? In order for hotels to comply effectively with the regulation, they need to ensure they review their connections to data processors, their own security policies, and if they have the necessary qualified staff on hand to negotiate the new laws. Data Mapping: Hotels receive personal data details through multiple channels and touchpoints including email, fax, phone, website, forms, etc., and this data is often stored on multiple platforms across several departments, so one of the first issues a hotel needs to tackle is to complete a full data map to become aware of what data is captured, where this information is stored, who manages the data, how it is used, including where it ends up, before beginning the process of how to protect and monitor it moving forward. Data Security Assessment: Once data mapping is completed hotels need to decide how information will be stored and handled, and then tested and documented on how to secure the data is and identify any weaknesses. Hardware and software applications should also be reviewed along with hard copy files. If the information is stored electronically, a series of encryption codes, passwords or limitations on access may need to be implemented to protect access to, and the integrity of the data. Implementation of new GDPR policies: One of the key principles of GDPR is not to retain personal data for longer than necessary. Although onerous, your current data records will need to be cleaned up – deleting what is not required and validating the data that is required. Invest in training of all relevant staff members to ensure they have a thorough understanding of the new procedures and the implications of the regulation. Provide regular refresher training for all staff to ensure an awareness culture exists and protect against possible breaches. Ensure employees know the processes in the event of a breach and to report any mistakes immediately to the DPO or the person or team responsible for data protection compliance. Hotels, both large and small, often make mistakes when it comes to personal data but under the new GDPR, the penalties for doing so will now be far higher. A misuse or breach of personal data will carry the risk of administrative fines of up to 4% of total annual worldwide turnover (which is huge), not only that but you also run the risk of tarnishing your reputation and end up paying out for damage claims. No matter what you decide to do to achieve GDPR compliance if you haven’t already started, it is vital that you begin preparing for GDPR now. 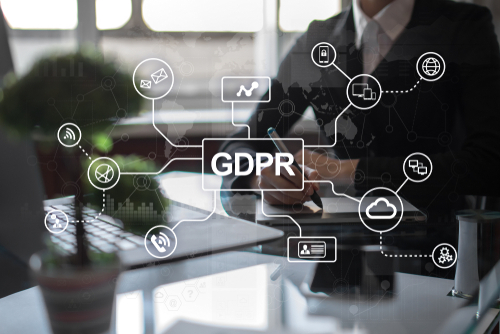 Becoming GDPR compliant will not only take longer than you realize, but failure to comply and update your data protection processes to safeguard guest data means you run the risk of severe financial penalties. In a short space of time smartphones have become integral to people’s’ life. We are now used to getting things done in a matter of seconds, whether it is communicating, accessing information, making transactions, ordering food, taxis and so on, we expect to be able to browse, order and pay for goods and services, all at the touch of a finger. Regardless of the industry – banking, retail, travel or hospitality, consumers have adopted an intuitive digital, mobile-first mindset that is only going to grow over time. Knowing that it’s not surprising to hear that the proliferation of mobile devices within the travel ecosystem is increasingly becoming an essential part of the guest journey. Guests increasingly view their mobile devices as the key to making their entire stay more convenient and perceive mobile as the future of the guest experience. A Hotels.com global study found that 76% of travelers named their mobile device their number one travel accessory, with twice as many people choosing to travel with it than with their loved ones! That’s how much we love our mobile devices! In today’s age of immediacy, convenience and technological haste, the traditional hotel property management system (PMS) is now no longer relevant to modern-day guests’ lifestyles. Though they may have met the needs of hoteliers in the past, the future favors modern, cloud-based and mobile PMS solutions. Mobilize both back-of-house and guest-facing operations, a hotelier cloud-based PMS helps hoteliers deliver mobile service options that increase guest satisfaction, operational efficiency, and profitability. Mobility should be a priority for hoteliers – if it isn’t currently on the top of your agenda here are some real-world advantages of a mobile PMS that will make you reconsider. According to Google research, 73% of travelers want to use their mobile device for check-in. Mobile check-in offers convenience allowing guests to skip the queue at the front desk. Not only that but when guests have the option to check-in via their smartphones whether it’s prior to their arrival at the hotel, or via mobile self-serve kiosk, they can confirm personal details and receive access to last-minute room upgrades, add-ons or upsells without feeling pressured. All in all, mobile check-ins are associated with higher levels of customer satisfaction and increase spending! Gone are the days where hotel staff need to be chained to their desks – and what’s more, your guests are aware of this! 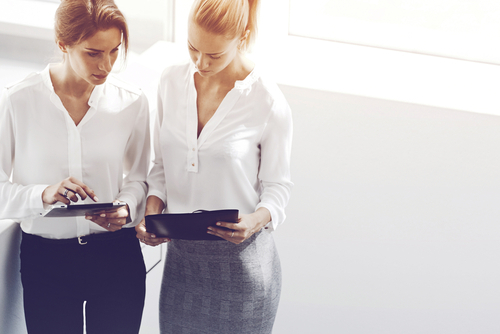 Giving employees from all departments the mobile tools to perform updates and access data away from the front desk can eliminate service issues, long wait times and annoyed guests. Equipped with a mobile device, and a mobile-friendly PMS, hotel staff can complete a myriad of hotel operations free from the limitations of traditional desktop-confined software. Front office staff can greet guests on arrival, issue mobile room key access, offer add-ons and upgrades, promote in-house services and amenities, complete transactions etc. ; a concierge with a mobile device can host guests in the comfort of the lobby, at the pool; and even housekeeping, armed with a mobile device can turn over rooms more quickly and reduce the need for paper management. A centralized, mobile-friendly system not only helps deliver a more personalized service but encourages staff and inter-departmental communications, making operations more efficient. Being able to deliver and access real-time data seamlessly is the key to delivering the ultimate in guest service and satisfaction. As the hospitality industry becomes more competitive, the ability of staff to engage with guests and run daily operations on-the-go, anywhere on the property, is essential. By enabling immediate access to view and update pertinent guest and property information in real-time, a mobile PMS empowers hotels of all sizes to reinvent and automate processes, be more responsive, focus on strategic marketing and yield opportunities but most importantly, deliver more personalized service. This list is by no means exhaustive but these are a few of the real-world advantages to be gained by having a mobile PMS. A mobile PMS empowers hotel managers and employees to make smart choices and serve guests better. Not embracing the available technology is akin to missing opportunities to grow your business. Mobile hospitality is the future of our industry, and it should be at the top of the list. 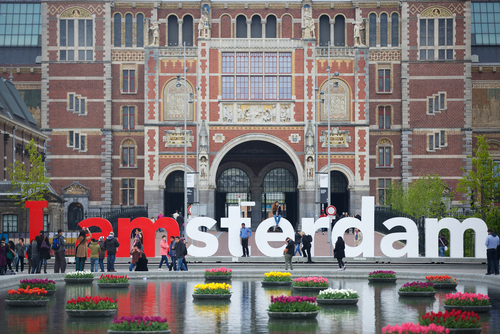 While there is so much to see and do at HITEC, your itinerary might be chock-a-block and we know time might be limited to fit in extracurricular activities BUT Amsterdam is reckoned to have more culture per capita than any other city on Earth – thanks to its diminutive size and myriad museums! And while there’s a world of things to see and do in Amsterdam here are 5 things, we think, you should do while at HITEC Amsterdam – if you get a chance! First off, transportation. Amsterdam is one of those cities that is drenched in clichés, from clogs and tulips, canals and “Coffee” shops. But there are some clichés that just cannot be ignored. Cycling is a way of life in Amsterdam – everybody uses bikes. So while you have the opportunity why not ride in style like an Amsterdammer or Mokummer as the locals would say – there really is no better or easier way to explore and enjoy the city’s streets, canals (which became part of the UNESCO World Heritage list in 2010) and attractions than by pedal power. And as you could have guessed, with over 880, 000 bikes in Amsterdam (that’s more bikes than people) finding a bike to rent is not a problem and there are plenty of rental shops around. And if you don’t want to go it alone and/or if your company wants to fit in some teambuilding exercises while attending HITEC, tandem bikes are also available! Besides bikes, another famous feature of Amsterdam is its canals. Amsterdam 17th century canal ring area, which received UNESCO world heritage status in 2010 is one of the marvels of the world’s architecture. Half circular, man built canals with tens of bridges, water locks, new city defense walls and thousands of individual building parcels were planned in 1612 and to this day, remain intact and practically unchanged – pretty impressive! It’s safe to say the Amsterdam canals make the city and if you want to learn a bit about just about Amsterdam was built a visit to the Museum of the Canals (Het Grachtenhuis) is the perfect way to learn more about the history of Amsterdam’s Canal Ring. Taking less than an hour, you are taken on a whirlwind journey through 400 years of history. The museum shows you not only why the creation of the Amsterdam canals was so unusual, but also why they are still special today. Seeing it makes you better understand not only the history of the Amsterdam canal area but also the social make-up of the city, its traditions and its spirit. Keeping with the cliché theme, the Netherlands have long been associated with the images of rainbow carpeted flower fields and bright bunches of tulips, but despite their fame, tulips are surprisingly not as easy to find in the streets and gardens of Amsterdam itself. 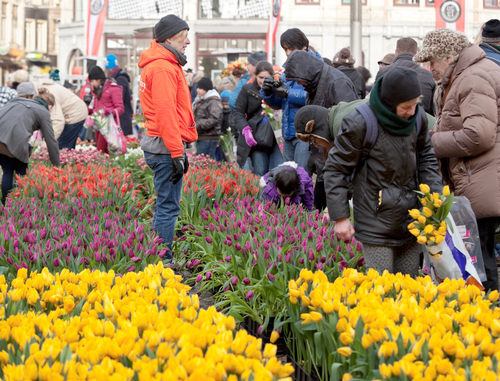 But as of 2015, each spring Amsterdam now celebrates the famous flower with the Tulip Festival. The aim of the festival is to plant eventually one tulip for each individual citizen of Amsterdam (which is pretty cool) ensuring that it blooms once again all over the city. The festival runs from the end of March until the end of April so while at HITEC you can enjoy them at various locations around the city… or as long as they are blooming. If you time and still have your bike, take the train to Haarlem where you can bike through the colorful bulb fields and find yourself surrounded by millions of tulips, crocuses, daffodils, and hyacinths – they are guaranteed not to disappoint. Within easy of reach of the RAI but also close to the heart of Amsterdam, is the Zoku hotel. While some would be put off at the thought of, or even the mere idea of going to a hotel lounge to “relax” Zoku offers something a little different to the average hotel. It has incredibly laid-back atmosphere whilst also being hospitable and highly service-oriented, and as well as the guests staying on property “internationally oriented locals” are also welcome to enjoy Zoku’s amazing social spaces that strike a perfect balance between work and leisure. If you need to log on and catch up on a bit of work, the Wi-Fi here is reliable, high-speed and best of all, free! If you’re a bit peckish, we definitely recommend you visit the Living Kitchen and sample their fresh and healthy dishes; or if you just want to unwind with a drink at the end of the day head up to one of their two rooftop terraces and take in the painfully scenic views of Amsterdam over a local beer… or liquor! AND if haven’t yet booked your accommodation for your upcoming trip to HITEC Amsterdam – need I say any more? And when checking in you can witness our, StayNTouch’s, PMS solutions at work. ** Pssst! For a 360-degree view of Amsterdam, head over to the A’DAM Tower with its Skydeck offering panoramic views of the city. At the Skydeck, you can find the highest swing in Europe, ‘Over the Edge’. 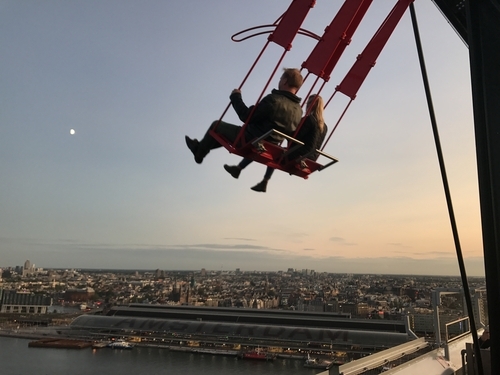 If you need an adrenaline kick you can swing 100 meters above the ground, back and forth over the edge of the tower with Amsterdam below your feet! We couldn’t do a piece on Amsterdam or HITEC and only mention one of our amazing hotel clients. As the name suggests, Conscious Hotels are an environmentally conscious hotel group – they strive to be as green, sustainable and eco-friendly as possible. While in the past, being a “friend of the earth” lead to some eye rolling and conjured up images of hippies, in the climate (no pun intended!) that we currently find ourselves in, this is a very appealing offer and will become even more so into the future. Not surprisingly they won the Best Hotel Concept 2017. Why? All their energy comes from renewable sources. Everything you see in their hotels is either recycled, or certified, or fair trade. Their breakfast and lunches are organic, along with a stock of organic drinks, tea, coffee and locally brewed beers. They have an eco-roof which homes a hive for wild bees. OH! And if you still haven’t rented a bike yet, you can rent a Roetz Bike at their reception! There’s so much to see and do while in Amsterdam, these are only a few suggestions that you might be able to squeeze into your trip! 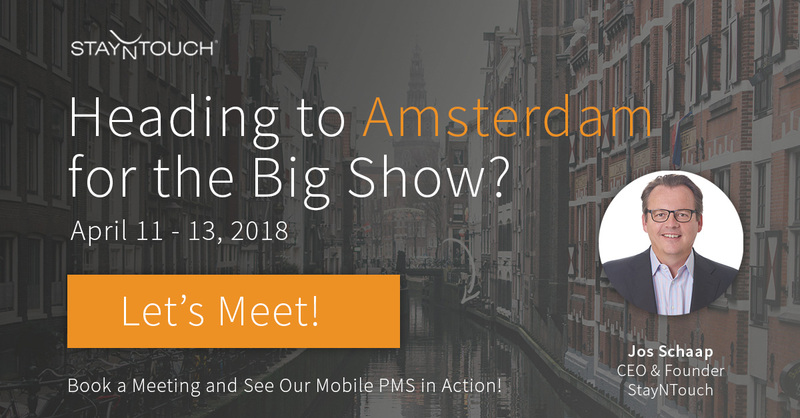 And don’t forget we’re also attending HITEC so if you want to drop by our stand or meet with a StayNTouch team member at HITEC Amsterdam, get in touch with us today! We can arrange a meeting where you will not only get to see our powerful, intuitive mobile PMS in action but you can test drive them yourself!